Our little Annie was diagnosed with global developmental delays when she was 6 month old. She was not able to roll over, crawl, or even lie on her tummy without crying. Her feet were deformed and stiff, and she sat with a hunchback. We did every therapy the doctor suggested us to do, but for one whole year, she showed very little improvement. We were devastated and totally lost. Then Amy came into our life. She explained to us how Annie’s reflexes were not integrated properly, how it affected her developments, and what we can do to fix those problems. In every session, she worked on Annie and showed us the reflex exercises we can do at home. The changes happened immediately, sometimes even right after the sessions. 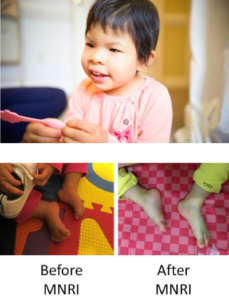 I still remember clearly how Annie started to straighten up her back right after Amy worked on the foot tendon guard reflex, to babble nonstop after the babinski reflex exercise, and to imitate our actions after the “Infinity Eight” tactile stimulation. All the changes were real, and they all make sense if you think about how those specific reflexes affect the functions of the body. Now Annie is able to walk with help. Her cognition has improved way beyond our expectation. Amy is smart, intuitive, and is without doubt the kindest person we’ve ever met. She cares about her clients on a personal level, and is always willing to go the extra mile for them. She literally led us out of the dark valley toward the mountain of hope, and we can never thank her enough for everything she has done for our little girl.